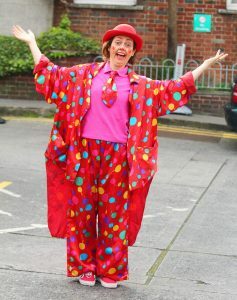 Brid Ni Chionaola, AKA Silly Sally, is an actor and clown originally from Waterford. She has been clowning professionally for 13 years at children’s parties and hospitals and recently joined the PartyWizz platform. She entertains with magic, walkabout clown, balloon modelling, games, face painting and so much more… With the combination of all these elements, there is something for every child at a Silly Sally Party. How did you get into clowning? I used to be a stilt walker for street performances but I lost my nerve. So I took up clowning instead to stay firmly on the ground! How did you learn the art? I studied physical theatre at the Jaques LeCoq theatre school in Paris and then when I moved to Dublin I trained with the well-known clown, Janey Mac. The actor Michael Murfi who went to the same theatre school and also Veronica Coburn. Clowning for kids is so rewarding – I love seeing their reactions. I don’t have my own children so it is great to still have a connection with kids. And the best bit about it is that my kids never grow up! What do you bring to a party or event? Years of experience and high energy. I take over the party for an hour and a half which takes the pressure off the parents hosting the party. I love my hospital shows. Also when I go to a family’s house and they clearly don’t have much money but they have given the kids everything they can. They always make me feel so welcome. I also love it when the adults get involved too. How has the kid’s party business changed? The traditional birthday party is still very much alive and If anything there is now even more work. In the age of iPad and video games, it is even more special and exciting for kids to see live entertainment. What do you think of the current image of clowns? The killer clown thing and films like ‘It’ is a worry as they’ve created a situation where some kids are initially frightened of clowns. However, it’s not really a problem as once people see you in action and get used to you, they realise that you’re not actually scary. Has this image affected your business? No, I don’t think so – but I suppose it could if the negative image gets too pervasive. What’s your favourite joke for kids? I love mindfulness and meditation and have just started teaching mindfulness for teenagers in schools. Don’t feed the kids sugary food until they are going home. It’s much easier for parents to control their own children individually than a mad collective sugar rush at the party! As a one-stop-shop, it’s great for people in a rush who want to get the party sorted in a few minutes. As well as the classic clown, Brid also plays several other characters at parties. If a clown it not for you, you can choose from a rather ditsy Fairy Godmother for a princess party, a Disco Diva or a swashbuckling Pirate. You can book Silly Sally through her entertainer profile page.